For countless generations, human beings have looked out at the night sky and wondered if they were alone in the universe. With the discovery of other planets in our Solar System, the true extent of the Milky Way galaxy, and other galaxies beyond our own, this question has only deepened and become more profound. An extrasolar planet, also called an exoplanet, is a planet that orbits a star (i.e. is part of a solar system) other than our own. Our Solar System is only one among billions and many of them most likely have their own system of planets. As early as the sixteenth century, there have been astronomers who hypothesized of the existence of extrasolar planets. The first recorded mention was made by Italian philosopher Giordano Bruno, an early supporter of the Copernican theory. In addition to supporting the idea that the Earth and other planets orbit the Sun (heliocentrism), he put forward the view that the fixed stars are similar to the Sun and are likewise accompanied by planets. Since Newton’s time, various claims have been made, but which were rejected by the scientific community as false positives. In the 1980’s, some astronomers claimed that they had identified a some extrasolar planets in nearby star systems, but were unable to confirm their existence until years later. One of the reasons why extrasolar planets are so difficult to detect is because they are even fainter than the stars they orbit. Additionally, these stars give off light that “washes” the planets out – i.e. obscures them from direct observation. As a result, the first discovery was not made until 1992 when astronomers Aleksander Wolszczan and Dale Frail – using the Arecibo Observatory in Puerto Rico – observed several terrestrial-mass planets orbiting the pulsar PSR B1257+12. It was not until 1995 that the first confirmation of an exoplanet orbiting a main-sequence star was made. In this case, the planet observed was 51 Pegasi b, a giant planet found in a four-day orbit around the Sun-like star 51 Pegasi (approx 51 light years from our Sun). Initially, most of the planets detected were gas giants similar to, or larger than, Jupiter – which led to the term “Super-Jupiter” being coined. Far from suggesting that gas giants were more common than rocky (i.e. “Earth-like“) planets, these findings were simply due to the fact that Jupiter-sized planets are simply easier to detect because of their size. Named after the Renaissance astronomer Johannes Kepler, the Kepler space observatory was launched by NASA on March 7th, 2009 for the purpose of discovering Earth-like planets orbiting other stars. As part of NASA’s Discovery Program, a series of relatively low-cost project focused on scientific research, Kepler’s mission is to survey a portion of our region of the Milky Way to find evidence of extrasolar planets and estimate how many stars in our galaxy have planetary systems. Relying on the Transit Method of detection (see below), Kepler’s sole instrument is a photometer that continually monitors the brightness of over 145,000 main sequence stars in a fixed field of view. This data is transmitted back to Earth where it is analyzed by scientists to look for any signs of periodic dimming caused by extrasolar planets transiting (passing) in front of their host star. The initial planned lifetime of the Kepler mission was 3.5 years, but greater-than-expected results led to the mission being extended. In 2012, the mission was expected to last until 2016, but this changed due to the failure of one the spacecraft’s reaction wheels – which are used for pointing the spacecraft. On May 11, 2013, a second of four reaction wheels failed, disabling the collection of science data and threatening the continuation of the mission. On August 15, 2013, NASA announced that they had given up trying to fix the two failed reaction wheels and modified the mission accordingly. Rather than scrap Kepler, NASA proposed changing the mission to utilizing Kepler to detect habitable planets around smaller, dimmer red dwarf stars. This proposal, which became known as K2 “Second Light”, was approved on May 16th, 2014. Since that time, the K2 mission has focused more on brighter stars (such as G- and K-class stars). As of October 13th, 2016, astronomers have confirmed the presence of 3,397 exoplanets and 573 multi-planet systems, the vast majority of which were found using data from Kepler. All told, the space probe has observed over 150,000 stars in the course of its primary and K2 missions. In November 2013, astronomers reported, based on Kepler space mission data, that there could be as many as 40 billion Earth-sized planets orbiting in the habitable zones of Sun-like and red dwarf stars within the Milky Way. It is estimated that 11 billion of these planets may be orbiting Sun-like stars. The discovery of exoplanets has also intensified interest in the search for extraterrestrial life, particularly for those that orbit in the host star’s habitable zone. Also known as the “goldilocks zone“, this is the region of the solar system where conditions are warm enough (but not too warm) so that it is possible for liquid water (and therefore life) to exist on the planet’s surface. The first planet confirmed by Kepler to have an average orbital distance that placed it within its star’s habitable zone was Kepler-22b. This planet is located about 600 light years from Earth in the constellation of Cygnus, and was first observed on May 12th, 2009, and then confirmed on Dec 5th, 2011. Based on all the data obtained, scientists believe that this world is roughly 2.4 times the radius of Earth, and is likely covered in oceans or has a liquid or gaseous outer shell. 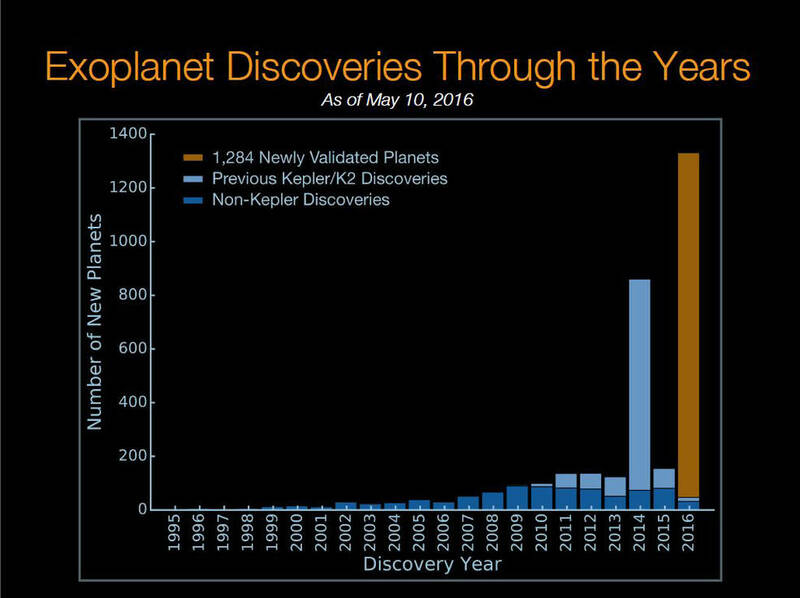 Prior to the deployment of Kepler, the vast majority of confirmed exoplanets fell into the category of Jupiter-sized or larger. However, as of Sept. 18th, 2015, Kepler has identified 4,696 potential candidates, many of them falling into the categories of Earth-size or “Super-Earth” size. 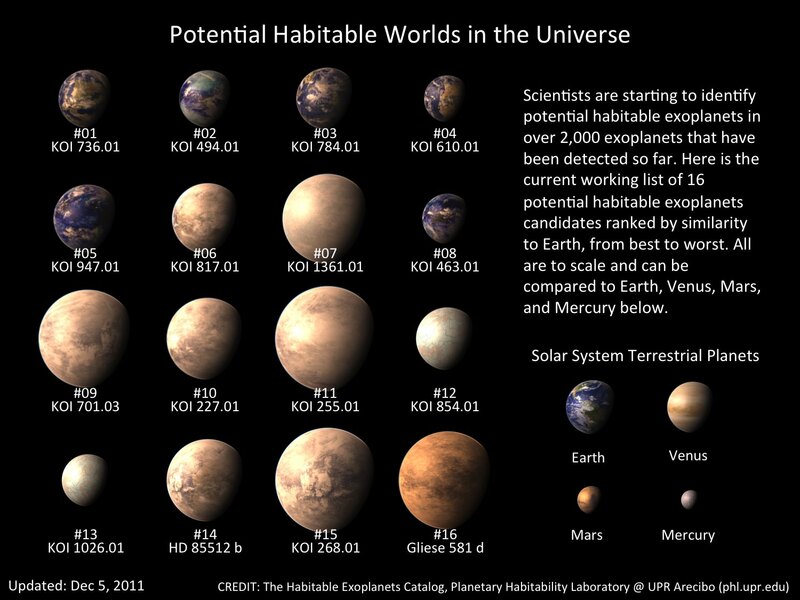 Many of these are located in the habitable zone of their parent stars, and some even around Sun-like stars. And according to a recent study from NASA Ames Research Center, analysis of the Kepler mission data indicated that about 24% of M-class stars may harbor potentially habitable, Earth-size planets (i.e. those that are smaller than 1.6 times the radius of Earth’s). Based upon the number of M-class stars in the galaxy, that alone represents about 10 billion potentially habitable, Earth-like worlds. While some exoplanets have been observed directly with telescopes (a process known as “Direct Imaging”), the vast majority have been detected through indirect methods such as the transit method and the radial-velocity method. In the case of the Transit Method, a planet is observed when crossing the path (i.e. transiting) in front of its parent star’s disk. When this occurs, the observed brightness of the star drops by a small amount, which can be measured and used to determine the size of the planet. The transit method reveals the radius of a planet, and it has the benefit that it sometimes allows a planet’s atmosphere to be investigated through spectroscopy. However, it also suffers from a substantial rate of false positives, and generally requires that part of the planet’s orbit intersect a line-of-sight between the host star and Earth. As a result, confirmation from another method is usually considered necessary. Nevertheless, it remains the most widely-used means of detection and is responsible for more exoplanet discoveries than all other methods combined. The Kepler telescope uses this method (see above). The Radial Velocity (or Doppler Method) involves measuring the star’s radial velocity – i.e. the speed with which it moves towards or away from Earth. The is one means of detecting planets because, as planet’s orbit a star, they exert a gravitational influence that causes the star itself to move in its own small orbit around the system’s center of mass. This method has the advantage of being applicable to stars with a wide range of characteristics. However, one of its disadvantages is that it cannot determine a planet’s true mass, but can only set a lower limit on that mass. It remains the second-most effective technique employed by exoplanet hunters. Other methods include Transit Timing Variation (TTV) and Gravitational Microlensing. The former relies on measuring the variations in the times of transit for one planet to determine the existence of others. This method is effective in determining the existence of multiple transiting planets in one system, but requires that the existence of at least one already be confirmed. In another form of the method, timing the eclipses in an eclipsing binary star can reveal an outer planet that orbits both stars. As of August 2013, a few planets have been found with this method while numerous more were confirmed. In the case of Gravitational Microlensing, this refers to the effect a star’s gravitational field can have, acting like a lens to magnify the light of a distance background star. Planets orbiting this star can cause detectable anomalies in the magnification over time, thus indicating their presence. This technique is effective in detecting stars that have wider orbits (1-10 AUs) from Sun-like stars. Other methods exist, and – alone or in combination – have allowed for the detection and confirmation of thousands of planets. As of May 2015, a total of 1921 planets in 1214 planetary systems have been confirmed, as well as 482 multiple planetary systems. With the winding down of Kepler’s mission, and so many discoveries made within a short period of time, NASA and other federal space agencies plan to continue in the hunt for extrasolar planets. Proposed NASA missions that will pick up where Kepler has left off include the Transiting Exoplanet Survey Satellite (TESS) – which is scheduled for launch sometime in 2017 – and the James Webb Space Telescope, which is to be deployed in October of 2018. In addition, the European Space Agency (ESA) hopes to continue to map out a significant portion of the Milky Way Galaxy (including exoplanets) using its Gaia spacecraft – which commenced operations in 2013. The Herschel Space Observatory, and ESA mission with participation from NASA, has been in operation since 2009 and is also expected to make many interesting discoveries in the coming years. There’s a an entire Universe of worlds out there to discover, and we’ve barely scratched the surface! Universe Today has many interesting articles on exoplanets. Here’s What Does “Earthlike” Even Mean & Should It Apply To Proxima Centauri b?, Focusing On ‘Second-Earth’ Candidates In The Kepler Catalog, New Technique to Find Earth-like Exoplanets, Potentially Habitable Exoplanet Confirmed Around Nearest Star!, Planetary Habitability Index Proposes A Less “Earth-Centric” View In Search Of Life, Habitable Earth-Like Exoplanets Might Be Closer Than We Think. For more information, check out Kepler’s home page at NASA. The Planetary Society’s page on Exoplanets is also interesting, as is NASA Exoplanet Archive – which is maintained with the help of Caltech. Astronomy Cast has an episode on the subject – Episode 2: In Search of Other Worlds.